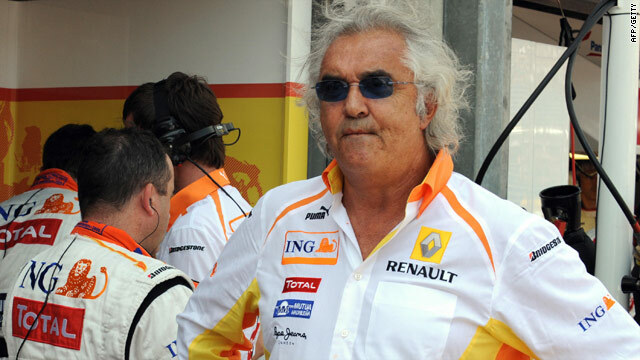 Former Renault team chief Briatore has mounted a successful challenge to his life ban from Formula One. (CNN) -- Flavio Briatore has successfully appealed against his lifetime ban from Formula One for his part in a race-fixing conspiracy at the 2008 Singapore Grand Prix, CNN confirmed Tuesday. Former Renault team boss Briatore was handed the ban last September by the World Motor Sport Council following an enquiry ordered by governing body, the Fédération Internationale de l'Automobile (FIA). It ruled that Briatore and his chief engineer Pat Symonds, who was given a five-year ban, ordered Renault driver Nelson Piquet Jr. to deliberately crash his car to help his teammate Fernando Alonso to win F1's first-ever night race in Singapore. Blog: Court ruling sets dangerous precedent. But both men have had their suspensions quashed by the French high court sitting in Paris. The pair were also seeking substantial damages against the FIA of $1.5 million, but they have been awarded €15,000 ($21,630) and €5,000 ($7,220) respectively. The court gave the FIA 15 days to pay Briatore and Symonds, otherwise it will be given a penalty of €10,000 ($14,420) per day. The FIA has yet announce whether it will appeal the ruling. The court said that it had not annulled the decision by the World Motor Sport Council, but ruled it to be "irregular" and non-effective due to Mosley's level of involvement, the UK Press Assocation reported. "The decision of the World Council was presided over by the FIA president, who was well-known to be in conflict with Briatore, with Mr Mosley having played a leading role in launching the inquiry and its investigation in violation of the principle of separation of the power of the bodies," its judgment said. The 59-year-old Briatore said "justice has been done", the Press Association reported. "As a sports person and one passionately involved in car racing for more than 20 years, the decision to apply to the civil courts to contest a decision of the FIA was a difficult one for me to take," the Italian said. "The court recognised all the criticisms I had formulated against the decision of the World Council were founded, by finding the FIA had rendered a decision it was not competent to pronounce, infringed its own articles of association, totally failed to respect my right to a fair defense and entrusted the tasks of investigation, prosecution and judgment to a principle player known by all to be hostile to me." Briatore said he would "enjoy this moment of happiness" before discussing whether he planned to return to F1. The court decision came soon after Renault, handed a two-year suspended ban at the FIA hearing over the Singapore incident, announced that Frenchman Eric Bouillier had been appointed as Briatore's replacement as team principal. The team is attempting to restore its reputation in the aftermath of the Singapore incident, which came to light after Piquet Jr. was sacked and then went public with his admission of involvement. Double world champion Alonso of Spain won the race -- the first for Renault in two years -- despite starting from 15th on the grid. Just two laps after Alonso came in early to take on more fuel, Piquet's crash forced the deployment of the safety car and the subsequent pit stop of nearly all the other drivers -- an action that promoted Alonso to fifth from where he went on to secure victory.